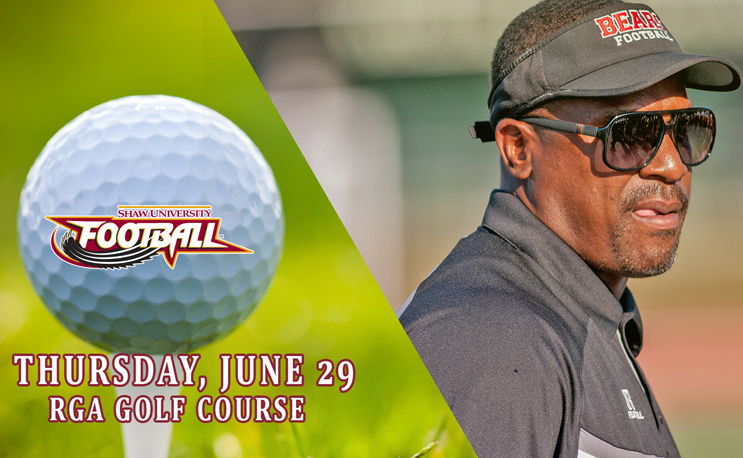 RALEIGH, NC – The Shaw University football program and head coach Adrian Jones will host the Shaw Football Golf Tournament on Thursday, June 29 at the RGA Golf Course. The event is open to the public and all proceeds will benefit the Shaw football team. The tournament will feature a tee-off at 9 a.m. The cost is $65 per person and $240 per team. On-site registration will begin at 10:30 a.m. The beautiful RGA Golf Course is located on 1527 Tryon Road, Raleigh, NC 27603. TIME: Tee Off at 9 a.m.
For more information, please contact Assistant Head Coach Gilbert Wiggins at (919) 546-8279 or by email at gilbert.wiggins@shawu.edu. For the most up-to-date information on Shaw football and its 13 varsity sport teams, visit shawbears.com.